For the mountain in Bolivia, see Quri Kancha (Bolivia). For the archaeological site of Intikancha in the Puno Region, Peru, see Intikancha. Coricancha, Koricancha, Qoricancha or Qorikancha ("The Golden Courtyard," from Quechua quri gold; kancha enclosure) was the most important temple in the Inca Empire. Originally named Intikancha or Intiwasi, it was dedicated to Inti, and is located at the old Inca capital of Cusco. Mostly destroyed after the 16th century war with the Spanish conquistadors, much of its stonework forms the foundation of the Santo Domingo church and convent. To construct Coricancha, the Inca utilized ashlar masonry, which is composed of similarly sized cuboid stones. 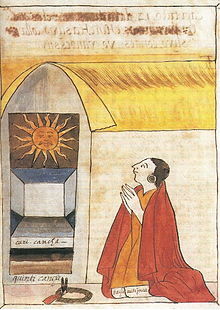 The use of ashlar masonry made the temple much more difficult to construct, as the Inca did not use any stone with a slight imperfection or break. By choosing this masonry type, the Inca intentionally demonstrated the importance of the building through the extent of the labor necessary to build the structure. Through the arduous labor needed to construct buildings with ashlar masonry, this form of construction came to signify the Inca's imperial power to mobilize local labor forces. The replication throughout Andean South America of Inca architectural techniques such as those employed at Coricancha further illustrates the Inca's control over a vast geographic region. The walls were once covered in sheets of gold,:218–219 and its adjacent courtyard was filled with golden statues. Spanish reports tell of its opulence that was "fabulous beyond belief". When the Spanish required the Inca to raise a ransom in gold for the life of the leader Atahualpa, most of the gold was collected from Coricancha. The Spanish colonists built the Church of Santo Domingo on the site, demolishing the temple and using its foundations for the cathedral. Construction took most of a century. This is one of numerous sites where the Spanish incorporated Inca stonework into the structure of a colonial building. Major earthquakes severely damaged the church, but the Inca stone walls, built out of huge, tightly interlocking blocks of stone, still stand due to their sophisticated stone masonry. Nearby is an underground archaeological museum that contains mummies, textiles, and sacred idols from the site. Similarities exist in the semicircular temples found in the Temple of the Sun in Cusco, the Torreon in Machu Picchu, and the Temple of the Sun in Pisac. In particular, all three exhibit a "parabolic enclosure wall" of the finest stonework, as Bingham describes it. Besides the structural similarities, there are similarities in usage, including the observation of solstices and Inca constellations. Within the Milky Way, which the Inca called mayu or Celestial River, the Inca distinguished dark area or clouds, which they called yana phuyu. These were considered silhouettes or shadows of animals drinking from the river water. Amongst the animals visible to the Inca, a llama extended from Scorpius to Alpha Centauri and Beta Centauri, in which those two stars formed the llama's eyes, or llamacnawin. A baby llama, llama-cria, was inverted underneath. To the left of the llamas is a red-eyed fox, atoq, which lies between Sagittarius and the tail of Scorpius. The tail of Scorpius is a storehouse, or Qullqa. A partridge, yutu, was just below the Southern Cross, and a toad, hamp'atu, to the lower right. A serpent, machaguay, extends off to the right. ^ Ring, Trudy; Watson, Noelle; Schellinger, Paul (2013). The Americas: International Dictionary of Historic Places. Routledge. p. 183. ISBN 9781134259304. ^ Krupp, E. C. (2012). Echoes of the Ancient Skies: The Astronomy of Lost Civilizations. Courier Corporation. pp. 271–272. ISBN 9780486137643. ^ Hyland, Sabine (2011). Gods of the Andes: An Early Jesuit Account of Inca Religion and Andean Christianity. Penn State Press. p. 8. ISBN 0271048808. ^ Bauer, Brian S. (1998). The Sacred Landscape of the Inca: The Cusco Ceque System. University of Texas Press. ISBN 9780292792043. ^ Bauer, Brian S. (2004). Ancient Cuzco: Heartland of the Inca. University of Texas Press. pp. 139–158. ISBN 9780292792029. ^ "Machu Picchu, la Eternidad de la Piedra". Edición Extraordinaria (in Spanish). Universidad Alas Peruanas. 6 (9): 79–87. 2011. ^ DK (2016). DK Eyewitness Travel Guide: Peru. Penguin. p. 163. ISBN 9781465458919. ^ Inc, Encyclopaedia Britannica (2010). Native Peoples of the Americas. Encyclopaedia Britannica, Inc. p. 74. ISBN 9781615353651. ^ Compendio histórico del Perú (in Spanish). Editorial Milla Batres. 1993. pp. 586, 593. ^ "GRUPO ARQUEOLÓGICO DE QORICANCHA". Retrieved 2017-05-29. ^ a b c d e Carolyn Dean, “The Inka Married the Earth: Integrated Outcrops and the Making of Place,” The Art Bulletin 89, no. 3 (2007): 502–18. ^ Cieza de León, Pedro (1998) [ca. 1553]. 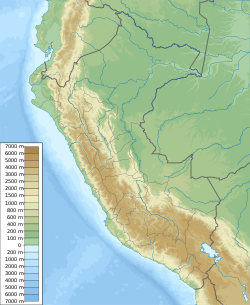 The Discovery and Conquest of Peru. Chronicles of the New World Encounter. Translated and edited by Alexandra Parma Cook and Noble David Cook. Duke University Press. ISBN 0-8223-2146-7. ^ Dearborn, D.S.P. ; White, R.E. (1983). "The "Torreon" of Machu Picchu as an Observatory". Archaeoastronomy (No. 5). ^ Bingham, Hiram (1952). Lost City of the Incas. Weidenfeld & Nicolson. pp. 268–269. ISBN 9781842125854. ^ a b c Krupp, Edwin (1994). Echoes of the Ancient Skies. Mineola: Dover Publications, Inc. pp. 47–51. ISBN 9780486428826.